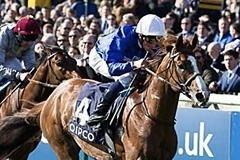 The Godolphin glory days returned as Hawkbill fought off all challengers to win the Coral-Eclipse Stakes. The likes of Daylami and Refuse To Bend have been among Godolphin's winners of this key midsummer Group One in the past, and although times have been leaner for Sheikh Mohammed's outfit in recent years, Hawkbill showed plenty of guts to join their ranks. As expected, Countermeasure took the field along in the early stages as a pacemaker for Time Test, but the field were quite tightly-bunched behind turning for home. Hawkbill was the first to challenge for the lead, having sat second turning for home, and he saw off the challenge of Time Test on his inside well before the furlong-pole. But The Gurkha then emerged on the outside and appeared briefly to be getting the better of the argument, only for Hawkbill (6/1) and William Buick to fight back with zest. At the winning post, Hawkbill was going away from his rivals to score by half a length, with Time Test third and Countermeasure - like the winner, supplemented into the line-up at a cost of £30,000 - fourth and almost paying for himself. My Dream Boat proved most disappointing in fifth. "What a lovely horse and what a call by the whole team to supplement him - this is fantastic," Buick told Channel 4 Racing. "Winning these big races is very important, but it's so hard to do - and it's come at a big time for me too. "He goes in the ground very well and the future is very bright for him. His demeanour has changed a lot this year, he's grown up physically, he's grown up mentally. He's shown us all of the attributes of a great racehorse. I'm a little bit speechless - it's just great for the team." The jockey now starts a 30-day ban recently collected in France. Godolphin chief executive John Ferguson, who cannot have imagined that his new role would have started so pleasingly, embraced Appleby and fellow Darley bigwig Jono Mills in celebration as Hawkbill passed the winning post, but took a calmer approach a few minutes later. "It's a big day and a great team effort," he said. "Sheikh Mohammed was very keen that we supplement this horse and I'm delighted for him. He's back in Dubai watching, we've already spoken to him and he's thrilled. "Everybody plays such a huge role in making these things happen, so when it does happen it's really special. "These are huge events to win, for Godolphin and any other owners. He's a horse that has improved and improved and the sky is the limit for him." He added: "I think it's going to be a really enjoyable time now thinking where to go, hopefully His Highness will be back for the July Meeting (at Newmarket) and we can all sit down and have a think about where we go next. "There's no hurry and the horse has a great future in front of him." Aidan O'Brien agreed that the winner might just have outstayed The Gurkha, but left the door open to a re-match with Galileo Gold in the Sussex Stakes back over a mile at Goodwood at the end of last month. "We thought he might take another run on the way to Goodwood and he travelled plenty well, but maybe the last half-furlong was just too far for him," said the trainer. "He was going so well that we thought we might as well come here but it hasn't quite worked out, even though he ran very well. We always saw him as a Galileo with a lot of speed - a real miler. "I think he could still go to Goodwood. The lads will talk about it. Our original thought after Ascot was to go there."